DJ Carmichael Pty Limited (“DJC”) has been invited to participate in a Capital Notes offer (“Offer”) being undertaken by National Australia Bank Limited (“NAB” or the “Company”). 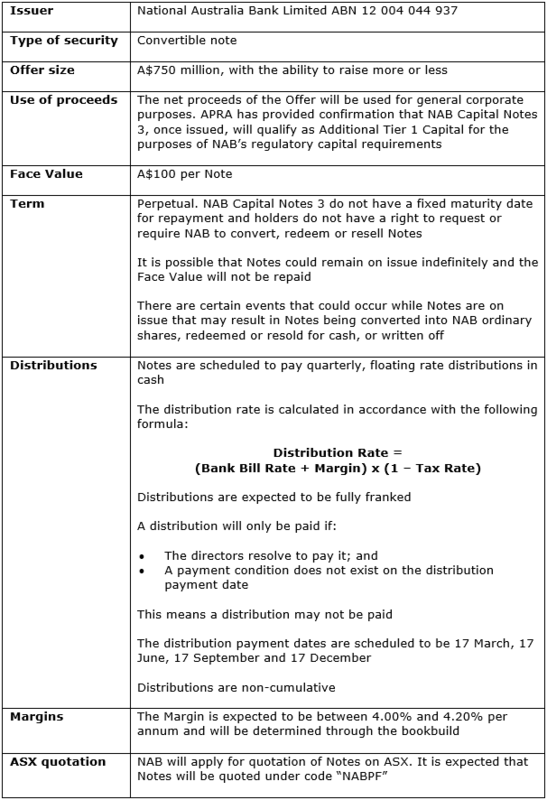 NAB is seeking to raise $750 million (with the ability to raise more or less) via the issue of 7.5 million Capital Notes 3 (“Notes”) at a face value of $100 per Note. Offer Notes will be issued pursuant to a prospectus that was lodged with the Australian Securities and Investments Commission (“ASIC”) on 11 February 2019 (“Prospectus”). The Company intends to issue a replacement prospectus on or around 18 February 2019 (“Replacement Prospectus”). The Prospectus can be found at www.nab.com.au. Investors should read the Prospectus and Replacement Prospectus (when available) before deciding whether to invest. NAB is a financial services organisation with approximately 33,000 employees, operating through a network of more than 900 locations, with more than 592,000 shareholders and serving approximately 9 million customers. The majority of the Group’s financial services businesses operate in Australia and New Zealand, with branches located in Asia, the UK and the US. Please refer to Sections 1.3 and 7 of the Prospectus for information on risks relating to an investment in Notes. DJC will be entitled to earn a fee of 0.75% plus GST of the value of Notes subscribed in the Offer. Your Adviser will receive 50% of this amount. For example, on an application of $10,000, DJC would receive $75 and your Adviser would receive $32.50. Please contact your Adviser as soon as possible, noting that the bookbuild may close early with no notice, if you would like further information or if you are interested in participating.